Please scroll down the page to see additional photographs of this item. 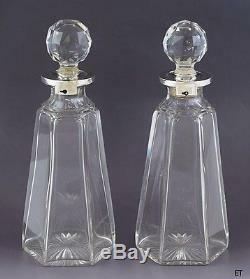 1898 Fab Pair Victorian English Sterling Silver & Cut Glass Locking Decanters. Presented is a fantastic pair of Victorian English sterling silver and glass/crystal decanters. 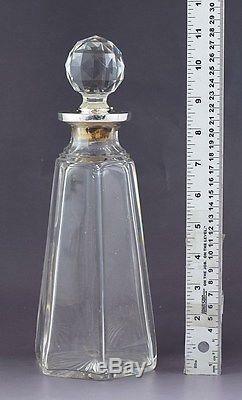 These decanters date to 1898 and were made by the Betjemann Brothers. The bodies of the decanters are beautifully cut glass or crystal, in a tapering, paneled form. The stoppers of the decanters are cut in a brilliant many-faceted ball form which is quite striking. 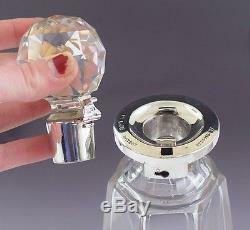 The bottles and stoppers have sterling silver mounts, with a locking mechanism. Each decanter has its own specific key, the keys do not seem to work interchangeably with the decanters. 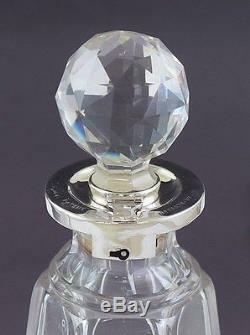 Each decanter is stamped on the collar with the lion passant for sterling silver, the leopard's head for the city of London, the date letter c for 1898 and the maker's mark for the Betjemann Brothers (John George Betjemann & Ernest Edward Betjemann), as well as'Patent' and a number, 25038-97. The latches on the stoppers are also stamped with the lion passant for sterling silver, the leopard's head for the city of London, and the maker's mark for the Betjemann Brothers. The decanters are in great overall condition. The glass has some very minor fleabites here and there, but nothing of any significance in our opinion. The stoppers fit in the necks very well. The locks and keys work, but the keys do have some wear and it takes some fiddling to get the locks open. There are no breaks, no monograms, no monogram removals, and no repairs. Each decanter stands about 11 inches tall. Because we are resellers, we are able to offer you more for your items than what scrappers would offer. The item "1898 Fab Pair Victorian English Sterling Silver & Cut Glass Locking Decanters" is in sale since Tuesday, April 12, 2016. This item is in the category "Antiques\Decorative Arts\Glass\Decanters".